Hail the Honda! The CB350F is one of the smallest and most sophisticated mass produced four-cylinders ever built. It was only built for two years from 1972-74. 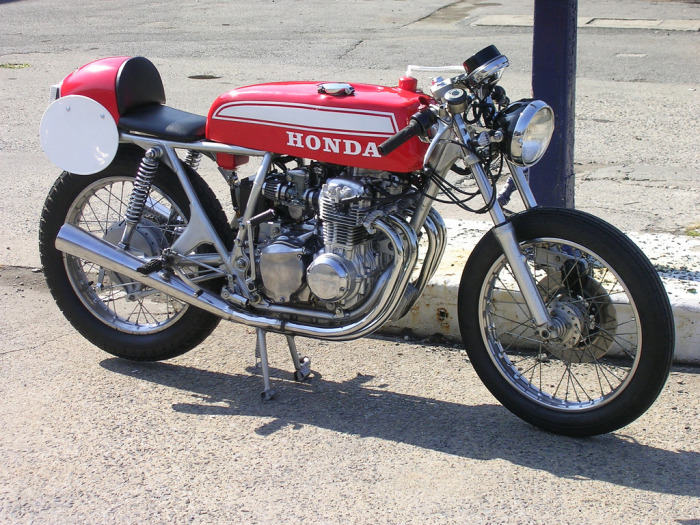 This 1974 Honda CB350F Cafe Racer was recently sold on ebay. The seller threw in the url cb350F.com to sweeten the deal. Judging by the new owners comments on his site like “sexist bike on the planet” he is obviously head over heals in love with his new purchase. Why wouldn’t he be? It’s a beautiful example of what a classic cafe racer should look like. Clip-ons, uncomfortable cafe seat and lots of chrome. For more pics check out this flicr gallery.